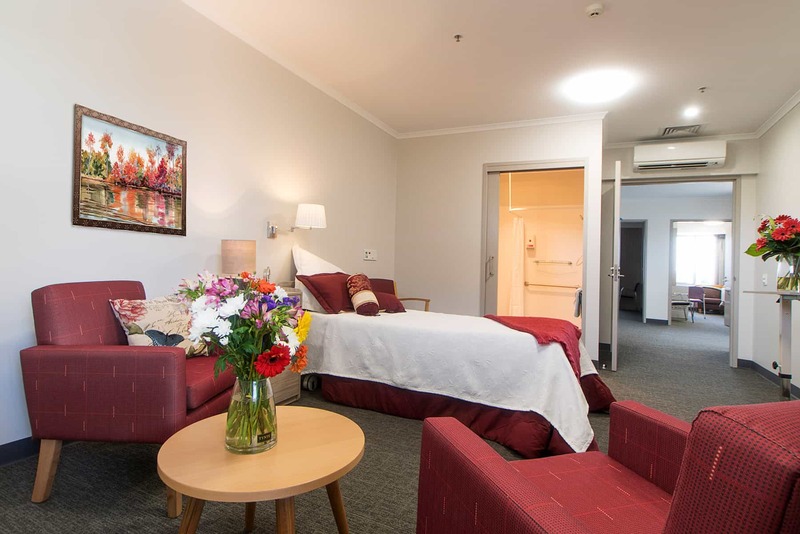 Click below to view our Frequently Asked Questions about Residential Care at Resthaven. Contact our Accommodation Enquiries team on (08) 8373 9113 or email: accommodation@resthaven.asn.au. What is the cost of residential care? The accommodation payment or room price varies from home to home. Click here to read more about room pricing. The basic daily fee and means tested care fee will be determined by the Department of Health following their assessment of your completion and submission of the Permanent Residential Aged Care – Request for a Combined Assets and Income Assessment form (SA457). Why do rooms have different prices? Individual room prices reflect a number of key features, including: room size, aspect, outlook, and location. Who can I ask about a vacancy at Resthaven? Resthaven will help you to apply in any way we can. There is no set waiting period. The type of accommodation required to meet your care needs. What happens if I don’t want to accept a room that has been offered? There is no penalty or disadvantage resulting from declining a room. Your application remains under consideration for all vacancies. Am I able to view a home before I accept a room? All homes have regular tours on at least a monthly basis. Visits at other times may also be arranged on request if required. This is an opportunity to view the home and discuss any questions you may have. How long may I consider whether to accept a room offer? In most circumstances, a decision about acceptance of the room on offer is needed by the following business day. Our Residential Accommodation Enquiries team work with you to ensure you have the required information to consider the accommodation, including relevant fees and charges. How soon do I have to move in? Having accepted a room, it is preferable to move in as soon as possible. Your family and friends may assist with the move and our staff will assist you to settle into your new home. Are rooms single or shared? The majority of rooms at Resthaven are single rooms with an ensuite bathroom. However, we also have some rooms suitable for couples to share. These rooms also have an ensuite bathroom. Can I bring my own things to furnish my room? At Resthaven, we encourage you to personalise your living space with personal items from home. We will provide a suitable bed and bedside table. The items you wish to bring in to personalise your living space is dependent on the size of the room and suitability of the items. Electrical items such as a toaster, microwave or iron are not permitted due to fire risk. All other approved electrical items must be checked for electrical safety prior to use in your room and this will be undertaken by our maintenance staff when you move in. Pets are most welcome to visit you through the day, provided they are suitably restrained (such as on a leash or in a carry basket) for the safety of all people. Unfortunately, we are unable to accommodate pets on a permanent basis. Some of our homes have a shared pet. Can I bring my gopher or electric wheelchair? Motorised chairs, including gophers, scooters and electric wheelchairs, may only be used by people who are assessed as being safe to do so. 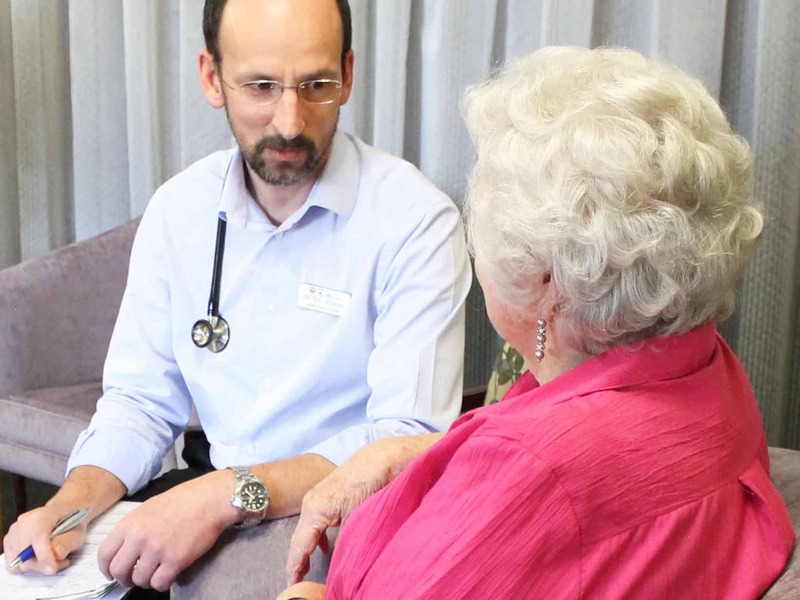 Our allied health staff, along with the nursing staff and Medical Practitioner, will assess a person’s ability on an individual basis, with reference to the safety of all persons within the home environment. Am I able to change rooms? In general, moving rooms is only considered if there is a genuine reason for the move, such as changing care needs. If the situation arises where you may be better accommodated in a different room, we will discuss this with you at the time. Resthaven has qualified nurses and personal carers on duty 24 hours per day. Staffing levels are determined on the basis of resident need and within our funding limitation, not according to predefined staff to resident ratios. There may be times where temporary additional staff are rostered for short-term periods as required, for example, palliative care and health deterioration. 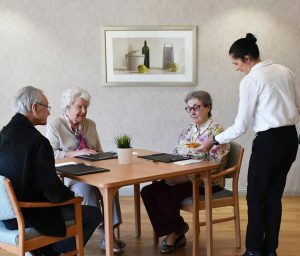 All Resthaven homes are supported by additional onsite staff in areas such as catering and cleaning, maintenance and gardening, clinical management and administrative support. 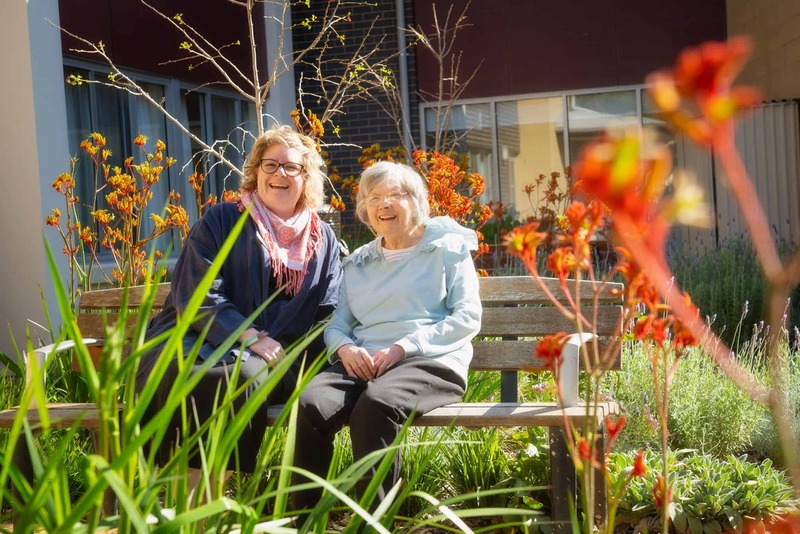 Resthaven employs senior nurse specialists such as a Nurse Practitioner Palliative Care, Advanced Practice Nurse Mental Health and Dementia and Continence Nurse Advisors, who are available to all homes to provide assistance and advice. 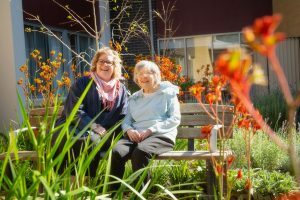 Yes, Resthaven offers an exceptional standard of palliative and end of life care at each of our homes. Staff onsite are also supported by a Nurse Practitioner specialising in Palliative Care. We will work together with you, your family and/or your support persons, and your Medical Practitioner, to provide individualised end of life care, at all times being respectful of your wishes and beliefs. We encourage all residents to complete an advanced care directive. This will indicate your choice and preferences with regard to your care as you enter the last stages of life. You are welcome to have visitors at any time, however consideration does need to be given to other residents in the area. Are the meals cooked onsite? Resthaven prides itself on the excellent quality and variety of our freshly cooked meals. Menus are developed in consultation with residents and are designed to provide variety and choice. We also have our menus reviewed by a dietitian to ensure nutritional balance. Do I need to label my clothing? Yes, all clothing laundered by Resthaven must have permanent labels in place. For your convenience, name labels are available for purchase from Reception and our staff will apply them for you. Do I need to provide bedroom and bathroom linen? Basic linen is supplied for you such as sheets, blankets, pillow cases, towels, etc., and this is laundered by an external contractor for Resthaven. You are welcome to use your own personal bed linen, but the laundering of this will be your responsibility. Resthaven provides a comprehensive laundry service for your convenience. We will take care of the laundering of your clothes if you wish. Our commercial washing machines and tumble dryers work at quite high temperatures, so clothing does need to be suitable for this type of launder. Clothing such as woollens and delicate items may not be suitable for our laundry service so we suggest you make alternative arrangements for those items. Resthaven respects the individual rights of residents and visitors to smoke, but smoking is only permitted in specific external designated areas. No smoking is permitted within Resthaven buildings, vehicles and enclosures or within the proximity of external doorways, windows and ventilation areas. Residents who wish to smoke will need to undertake a risk assessment by the nursing and allied health staff, to ensure you are safe to do so. 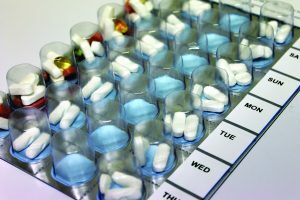 Who will manage my medications? Medication administration is the responsibility of qualified nurses and specially trained care staff at all Resthaven homes. Our staff will work with you to ensure safe and timely administration of your prescribed medications. Resthaven has a preferred pharmacy provider. Medicines ordered by your doctor are delivered to the home by the pharmacy. Residents choosing to use this provider for supply of their medicines have direct access to a limited after-hours emergency supply held on site. What is Resthaven’s complaints resolution process? In the first instance, we encourage you to raise any personal concerns with nursing staff or with the Manager, who is readily available, and committed to dealing with any concerns or complaints you may have. Resthaven has a “Complaints Resolution” procedure. This provides additional information on other avenues you may wish to pursue in the event your concerns have not been resolved to your satisfaction. Resthaven also provides a feedback brochure titled, “We’d like to hear from you,” which is readily available at various locations across all homes. This can be used for providing written feedback or comments. Feedback can also be given via email to headoffice@resthaven.asn.au.